Located on SE Division Street, Bay Leaf is easily one of my favorite restaurants in Portland. Fairly new to the Portland vegetarian scene, Bay Leaf generally doesn’t pop up when people rave about veg*n food in town. But why? Well for one, it can be overlooked because there are three other vegetarian asian restaurants in the city (Vegetarian House, Vege Thai and Van Hanh), and unless you’re going to Food Fight! and think of Bay Leaf and put aside the thought of Kalga Kafe, it’s not quite in the heart of Southeast. Perhaps, the biggest upset is that it does not serve faux meats. However, as someone who tends to order tofu over chicken style seitan, I’m a fan, particularly of the lunch specials, which are even on Saturdays. To note, apparently Bay Leaf’s owners used to own an omnivorous chinese restaurant in NY, discovered vegetarianism and health benefits, and closed their other esbtablishment and opened this one. 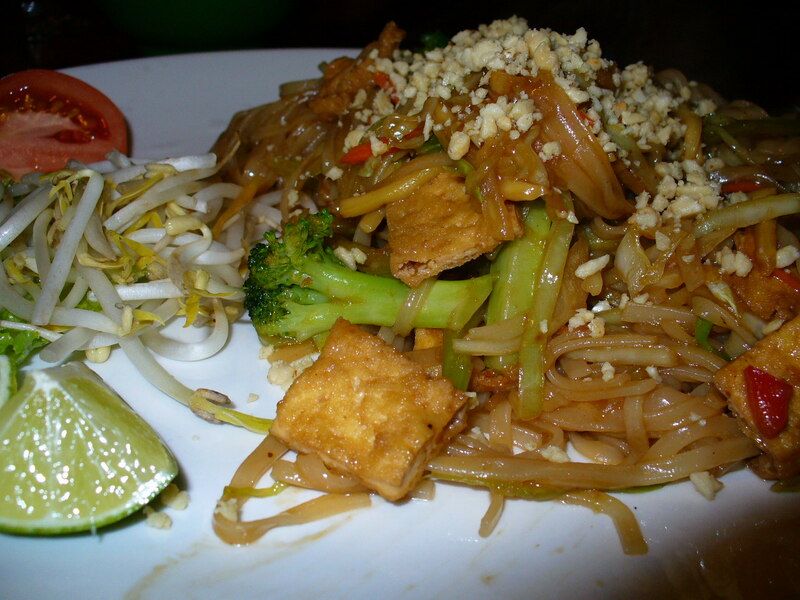 Bay Leaf provides its diners with a primarily vegan menu of asian delights, from pad thai, tofu hot pots, green curry, vegetable tempura, soups, appetizers, shakes, desserts and their much-talked about sesame tofu. The non-vegan items include shakes with dairy and desserts – inquire about their entrees if you’re not sure, they know what’s vegan. Even living nearby, I’m also guilty of overlooking Bay Leaf, but everytime I go I enjoy the dining experience immensely and kick myself for not going back sooner. The restaurant itself is super clean, calm and the beautifully presented food comes quite quickly. Dishes are often garnished with carrot flowers! The prices are fair, and their Monday – Saturday lunch specials offer the ideal chance to try them out. 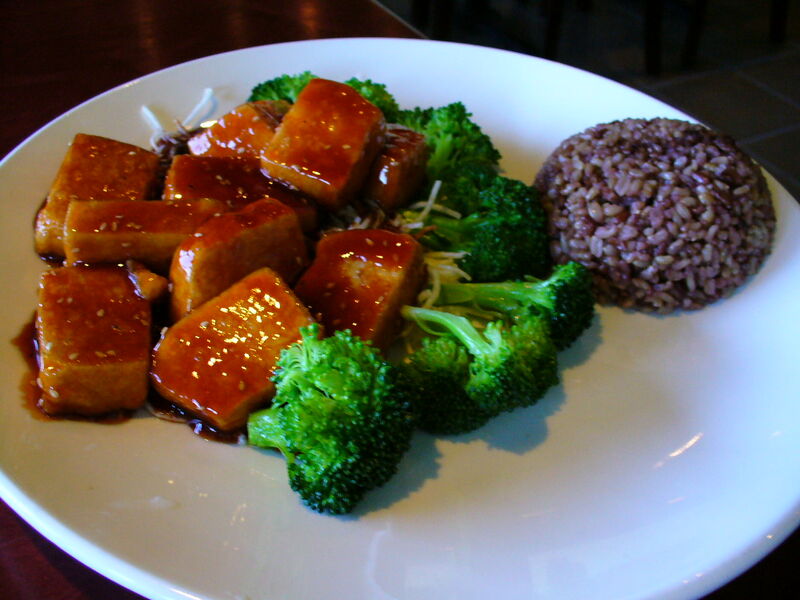 At $5.95, the specials offer a variety of 9 vegetable and tofu main dishes, as well as the daily hot and sour soup. On our most recent dinner visit, my dining partner and I both ordered the sesame tofu, something we both have ordered many times before. The tofu is crispy on the outside and soft and tender on the inside, smothered in a delectably tangy sweet sauce, and topped with a dash of sesame seeds. Steamed broccoli comes on the side. On this last occasion, my hot and sour soup came late with my entree, although the spring rolls were served ahead of time. I ate soup for a few minutes, and by the time I got my entree, the broccoli was cold. I was put off, but I still enjoyed my tofuw, which is good the I have to remind myself to branch out and try other dishes. It’s also so sweet you almost wish it wasn’t – but you accept it happily. It is definitely a dish that does not require dessert after, just cold water. The hot and soup is simply excellent. There’s a a nice touch of heat after each bite. The broth is light and soothing and the mushrooms and tofu additions are both tender. Their spring rolls with citrus dipping sauce are my favorite in town, very crispy, and you can taste the vegetable filling. Non noodle dishes come served with your choice of a brown rice mix, or white rice. I’ve been underwhelmed with the Mustard Greens and Tofu – not much flavor to it, though the whole chilies against the white and green are striking. The Vegetable Tempura is gratifying and light, though I wish the vegetable assortment was more than just potato, yam and and taro. Check out the special board, I’ve been impressed with the simple and sweet Mango Tofu myself. Their Pad thai is decent, and I enjoy the Eggplant Crisps with Kung Pao sauce, though it’s not quite crispy, and doesn’t really have the heat that’s noted on the menu. 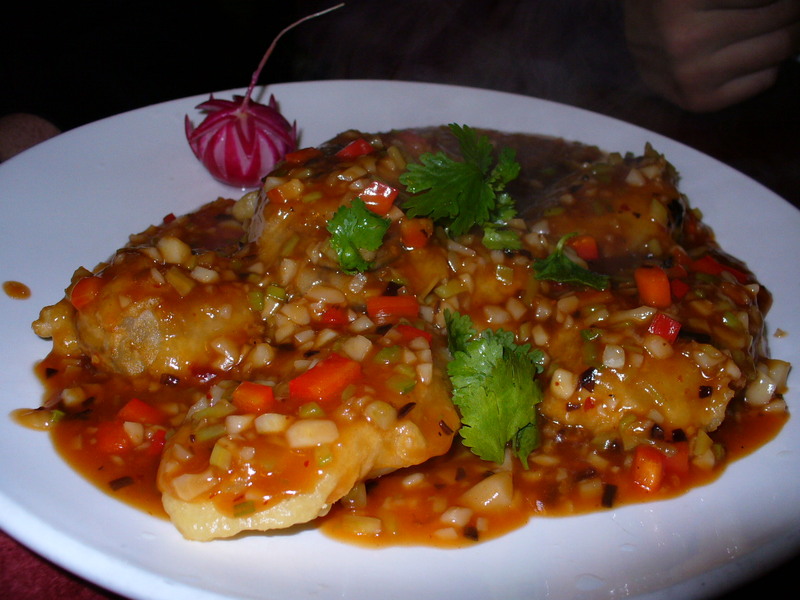 I’ve had it twice, and it consists of thick, battered eggplant slices, that really turn quite mushy in the miniscule chopped veggie-packed sauce. Again, I like this dish, but can’t eat a plate of it; I find it’s something that should be shared. You will notice many larger tables at Bay Leaf doing this – and I encourage you to try a ‘family style’ dinner this way there. Order a plate (or two) of the sesame tofu, a hot pot, tempura, china jade fried rice, some amazing avocado shakes (vegan), oolong tea and enjoy your dinner and company. I’ve also heard raves about the Dong Po Tofu in black bean sauce and the Mushrooms Crisps – which will be what I order next. In short, Bay Leaf is flat out just as good as when I first visited and reviewed last year, and the sesame tofu continues to captivate my taste buds. If it was across town, I’d still go out of my way to dine there. I do think the restaurant could boost its business with ‘beef’ and ‘chicken’ dishes, but offerings are their prerogative and clearly not their style, and I’ll frequent regardless. I like the look of those spring rolls. The vegan places down here always want to stuff them with some rubbery dense concoction. I just don’t get it. Two cheers for vegetable filling! If only I lived in Portland. This restaurant looks amazing. I’ve never been big on sub meats either. And, the tofu dishes are tugging at my heart right now..It’s time to plan a trip. I really enjoy Bay Leaf, but have trouble paying the price they ask, particularly since the food is often tepid in temperature and their teas are really expensive, and just regular bagged tea, not loose. I was there just a few days ago and when I asked if the noodle in the Cold Sesame Noodle dish were egg noodles, the waitress got mad and told me she didn’t know, that they were ‘yellow noodles’. So, I didn’t order that dish. Anyone had confirmation if those noodles are egg or not? There are yellow wheat noodles – I know Bay Leaf is not 100% vegan but I have not ordered that particular dish, so I have not inquired about the noodles.